BELGRADE – Greek President Karolos Papoulias met with Serbian Orthodox Church Patriarch Irinej at the end of a two-day visit to Serbia on Wednesday. 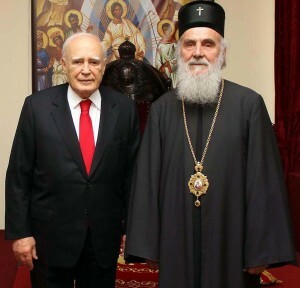 Papoulias and Irinej met at the Patriarchate building in Belgrade. The Greek president was welcomed in front of the Patriarchate by Bishop Andrej of Remesiana, Vicar Bishop to the Serbian Patriarch. During his stay in Belgrade, Papoulias met with top Serbian officials and attended a Greek-Serbian business forum. He said Greece strongly supports awarding Serbia a date for starting accession talks with the EU. In talks with Serbia’s state leaders, Papoulias stressed the traditional friendship between the two nations and said Greece will always stand by Serbia and assist it in implementation of European standards. While in Belgrade, Papoulias met with Serbian President Tomislav Nikolic, Prime Minister Ivica Dacic, and Parliament Speaker Nebojsa Stefanovic.